RStudioPortable Version 0.99.441 incorporates the 0.99.441 version of R Studio in a portableapps format. R Portable Version 3.2.0 has been released and is available at the R Portable project page, http://sf.net/projects/rportable/. Please update RStudio to the latest version to avoid the “Error in tools:::httpdPort < = 0L" error when using RStudio with R 3.2.0. R Portable Version 3.2.0 incorporates the 3.2.0 version of R in a portableapps format. RStudioPortable Version 0.98.1103 incorporates the 0.98.1103 version of R Studio in a portableapps format. R Portable Version 3.1.3 has been released and is available at the R Portable project page, http://sf.net/projects/rportable/. R Portable Version 3.1.3 incorporates the 3.1.3 version of R in a portableapps format. Okay, Joel, here it is. I got these instruction off of the Internet but I do not remember who was the original source. I keep this file in a RStudio project I call installed_packages. 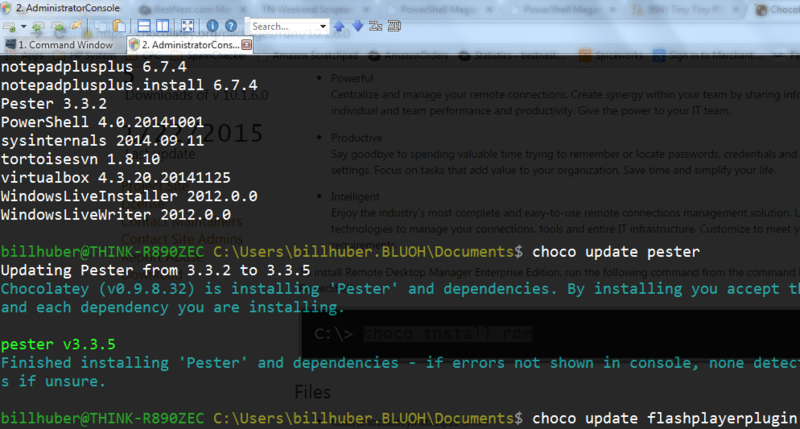 Before I upgrade I run the first two line to update the package_list. After I upgrade I go back to project, un-comment the install.packages line and run it. I also have a line in there if you want a csv copy of the installed packages. This month I have been fooling around with ConsoleZ. ConsoleZ by Christophe Bucher is the open sourced Windows Command Prompt replacement and is a fork of the more popular replacement application, Console2 by Marko Bozikovic. Since I was already using Console2 I already had customized tabs for Windows Command prompt, Ipython, Powershell, MinGW shell, and some custom DOS/Powershell applications. One of the tabs I wish I had was a DOS prompt with Administrator access. So I searched the web and found that Ben Garrett had solved that problem and few others I did not know I had in his post, Create A Better Windows Command-line Prompt. So I added an Administrator console tab, ANSI color, a DOSKEY macro to start Notepad++, GOW, and a colorized version of ls. It is almost as functional and colorful as a Linux prompt now. 😉 Here is what it looks like. This ZDNET article, “Over 90 percent of data breaches in first half of 2014 were preventable”, had me intrigued but it was their summary that really caught my attention. Since the latest explanation of how the North Koreans hacked Sony was that they stole a system administrator’s password by some method that is not discussed but vaguely confirmed by the NSA, we would have to conclude that the Sony breach was probably a staff mistake. The Online Trust Alliance says that a high percentage of data breaches were the result of staff mistakes — rather than external hacking. According to a recent Online Trust Alliance press release about 47% of data breaches was the result of staff mistakes and 40% were the result of external intrusions. Here is what they said. If The Sony Hack Was An Inside Job, When, Why, And How Did North Korea Decide To Plant A Spy At Sony? There are a lot of loose ends with the Sony hack that bother old IT guys like me. Kim Zetter in the article, The Evidence That North Korea Hacked Sony Is Flimsy, makes the point that nation-state attacks are not normally this noisy. This attack was public and filled with revenge-filled rhetoric that sounded distinctly non-North Korean. Marc Rogers in the article, Why the Sony hack is unlikely to be the work of North Korea, goes a step farther and says an insider is the likely culprit. So if we are to assume that the attack is from North Korea, we have to ask when, why, and how did they plant a spy at Sony? The mainstream news media seems to be proceeding under the premise that the North Koreans could walk into Sony either literally or electronically and collect extensive knowledge of Sony’s architecture including key passwords in a relatively short period of time. I think this supports main stream media’s agenda that this is technology problem all we need to do is install the latest and greatest firewall. The reality is that this type of hack is typically an inside job so it is a primarily a personnel rather than a technology problem. In most major corporations this type of broad access requires lots of time since security is compartmentalized and transferring passwords to new people is dependent on developing trust. Password management in a large corporation like Sony can be further enhanced by delegating password control to different people. In this case the passwords for administering email, human resources and accounting systems are probably controlled and periodically changed by the people who have operational control of those systems. So if the insider working for the North Koreans is a new hire or contractor then they must have been inserted into Sony months ago. This begs the question of why did the North Koreans target Sony months ago, develop such a sophisticated operation, and then release detailed information about this operation to the world. All of this work for a movie! The North Koreans may be crazy but I do not think they are stupid! If this hack is not North Koreans consumed by revenge over a movie, we have to conclude the insider was a long time employee or contractor who got the data directly off the servers or via malware installed on certain key computers. We are looking for a person with a Edward Snowden profile. Although some people who are skeptical of the North Korea explanation see a government conspiracy, my guess is our law enforcement agents are temporarily feeding the public misinformation to buy more time to complete the investigation and arrest the suspect while still in the United States. For a detailed list of the Sony hack events check out the Riskbased Security article, A Breakdown and Analysis of the December, 2014 Sony Hack. Author BillPosted on Monday, 22 Dec 2014 Tuesday, 23 Dec 2014 Categories SecurityTags SecurityLeave a comment on If The Sony Hack Was An Inside Job, When, Why, And How Did North Korea Decide To Plant A Spy At Sony? I was reading the Google article, Strengthening 2-Step Verification with Security Key, and decided to see how much strengthening my security would cost. Everyone says they want better security until they see the price tag. Surprisingly a security key does not cost much. The cheapest key on Amazon comes from Plug-up International, costs $5.99 with $2.00 postage, and my estimated delivery date is November 10. I can do that! Last week Discover notified me that due to the Home Depot data breach, my Discover debit card was going to be re-issued. Their solution is not cheap but it is the best way to improve credit card fraud protection. I decided to switch over to WordPress SEO(Yoast) yesterday and ran into a slew of problems with their sitemap generator, a 404 error, a blank screen, and a sitemap.xml not being properly re-directed to the new sitemap_index.xml. The first problem led me to this Yoast knowledge base article, My sitemap is giving a 404 error, what should I do? I fixed the first problem by adding the code to my .htaccess file. To fix the last two problems I added the RewriteRules for the xsl statement(Line 8) and the sitemap.xml(Line 5). Now both sitemap.xml and sitemap_index.xml are being properly redirected and formatted. My Google Webmaster Tools is happy! Note: The code below is for a WordPress blog in a sub-directory called wordpress. Author BillPosted on Friday, 18 Jul 2014 Tuesday, 16 Sep 2014 Categories RTags RLeave a comment on R Portable Version 3.1.1 and RStudioPortable Version 0.98.977 Are Released! Did P. F. Changs replace a high tech security breach with a low tech security breach? Last Wednesday my wife and I celebrated our 31st anniversary at P. F. Changs. We had a nice dinner and they ran our card through a manual imprint system. Today I noticed that they wrote my CVV on the receipt. That is not necessary if they were actually going to process my bill as a manual credit card transaction in which the card is present. By writing the CVV on the receipt that means that they plan to process the charge later as a card not present transaction. For those of you who have jumped through the PCI hoops, you have to wonder what measures they are using to protect these receipts since they now include the CVV. In the PCI world there are some pretty serious restrictions on keeping the CVV information secure. This is a dumpster diver’s gold mine. Okay, I am really annoyed. What is the best way for a company to continue their business after a data breach without annoying their customers? There are some interesting comments over at Krebs on Security but I have my own recommendation. As a long time developer I look for a good manual procedures to automate. In this case we are going in the opposite direction. We are breaking up a good automated procedure into standalone parts. In this case I would recommend creating a corporate web app to process the credit card transaction that would be very similar to the model used by internet retailers. In fact I would not be surprised if a corporate developer does not already have one they used to get through credit card processing certification. In this case either the waitperson or some other designated person enters the sixteen digit credit card number and CVV to run the transaction. If the transaction goes through then you update the bill in the restaurant’s order system with the confirmation code or reference ID. Is this a little more work? Yes but we literally have millions of people who enter their sixteen digit credit card number and CVV every day without exposing themselves to credit card fraud. There are a whole lot less PCI compliance issues with this procedure than a manual imprint with the customer’s CVV on the receipt. Author BillPosted on Saturday, 14 Jun 2014 Tuesday, 16 Sep 2014 Categories SecurityTags SecurityLeave a comment on Did P. F. Changs replace a high tech security breach with a low tech security breach? I have been using TrueCrypt for several years. It is not the key cog in my security plan but it is helpful. The TrueCrypt development process looked trustworthy and professional. So I was shocked with the developer’s announcement last week. It was just so weird, I thought the site had been hacked. The developer’s explanation on why he was stopping development bordered on incoherent. What does the end of Windows XP maintenance have to do with anything? As an old IT guy I decided to wait this mess out. There was an ongoing security review of TrueCrypt which should sort some of the issues out. For those conspiracy buffs out there, Snowden was a big fan of TrueCrypt. This weekend I decided to see if I could still download the source. It was not available at the normal location but I did locate it at Gibson Research Corporation who I recognize from Shields Up fame. Considering their reputation in the security game, they had some interesting some things to say. Then, leveraging the perverse and wrongheaded belief that software whose support was just cancelled renders it immediately untrustworthy, they attempted to foreclose on TrueCrypt’s current and continued use by warning the industry that future problems would remain unrepaired. This being said of the latest 7.1a version of the code that has been used by millions, without change, since its release in February of 2012, more than 27 months before. Suddenly, for no disclosed reason, we should no longer trust it? I will continue to use it until a better option becomes available. Although I doubt I will look at the code for security problems, I am curious what the security professionals find. I have been a customer for several years and generally speaking I have been pleased with the services I got from Bluehost. Recently I noticed some annoying variability in response time which appeared to be directly related to the shared host arrangement. I did a little shopping and found that for almost the same monthly price I could get a virtual server at DigitalOcean. My primary objective was to migrate two shared host WordPress blogs and an open source web-based news feed (RSS/Atom) reader called Tiny Tiny RSS from Bluehost to a virtual server at DigitalOcean. A secondary objective was to replace my web analytics with Piwik. My plan was to follow the DigitalOcean tutorial, How To Migrate WordPress from Shared Hosting to a Cloud Server with Zero Downtime, with a couple of changes. The tutorial was written for Ubuntu 12.04 LTS and I would be installed 14.04 LTS. Since I am a Windows guy I would be using Putty for SSH sessions and WinSCP to transfer files. The biggest change I made in this step was to backup of the entire WordPress folder. Several services asked me to put little files in the root directory as part of the approval process. I also have a customized .htaccess file. Since my copies of WordPress are up to date, it was easier and faster to copy over the entire folder. I followed the first four steps of the tutorial, Initial server setup for Ubuntu 14.04, but if I had to do it over again I would go ahead and configure ssh to restrict root login and explicitly permit certain users. Considering how many folks will be trying to break into your server, you might as start locking down the server. Next I followed the tutorial, How To Install Linux, Apache, MySQL, PHP (LAMP) stack on Ubuntu 14.04. Since I was going to restore the entire WordPress folder I skipped this step. In this step I started to follow the tutorial, How To Set Up Multiple WordPress Sites on a Single Ubuntu VPS. In my case I was going to use a wordpress folder under the default directory for the main blog and a second folder under www for the second blog. I created two virtual host files, yourdomain.com.conf and yourdomain1.com.conf, for my two blogs. The original tutorial omitted the conf extension. This is when I learned the most important lesson. My first Mysql backups were incomplete or bad when I tried to load them. I had poor results trying to load compressed files. So I made it simpler. I transferred them to the new server. I created the database and user. I loaded the uncompressed file. I transferred the compressed file to the server. I uncompressed the file in the home directory. Configure each wp-config.php with the new Mysql usernames and passwords for the databases you just loaded. This is a good time to make sure that the WordPress permissions are set correctly. For me everything worked except for mail and some hard coded links in the widgets. To solve the mail problem I installed the wordpress plugin, WP-Mail-SMTP, and sSMTP for a simple and lightweight MTA for the system messages. All of my messages are sent through Gmail. If you are using a CDN like Cloudflare that is linked to your Bluehost account, this would be good time to deactivate it. I did not and the response time was all over the map for a day. I did not need to install phpMyAdmin but DigitalOcean does have a pretty simple tutorial showing how to install it. I was originally planning to install Awstats but Piwik looked like a better choice. The 5-minute Piwik Installation was easy. After a little browsing of the auth.log it was easy to see that there was too much SSH traffic that was not originating from me so the solution was to follow this tutorial, How To Install and Use Fail2ban on Ubuntu 14.04. After running Fail2Ban for a couple days it became apparent that I needed to permanently ban some folks. I followed the tutorial, Permanently Ban Repeat Offenders With FAIL2BAN. Obviously I needed to look at the log files on a daily basis until I get this SSH hacking under control. The solution in this case was this tutorial, How To Install and Use Logwatch Log Analyzer and Reporter on a VPS. The first thing I noticed from looking at the authentication failures in the pam_unix section was that some of the folks were spacing out their probes to get around the default settings for Fail2Ban. So I expanded the findtime and bantime and maxretry. This caught some more hackers but it still was missing some others. So I brushed up on my grep, awk, and bash coding to find the worst of the bunch and ban them. Sorry China! There is something odd about restarting Faile2Ban. It looked it was working but it was not banning IPs I thought it should. Sure enough when I rebooted the server it would read the log file and immediately ban the IP. At this point I can say that the migration is complete. The sites are working and I fixed all of the configuration issues that showed up in the log files. The response time for the sites is much faster than on the shared host even though I added another application, Piwik. It looks like I can easily support another blog. I have another blog with a renewal date a couple of months from now. How To Use DigitalOcean Snapshots to Automatically Backup your Droplets, and it took about five minutes to complete. 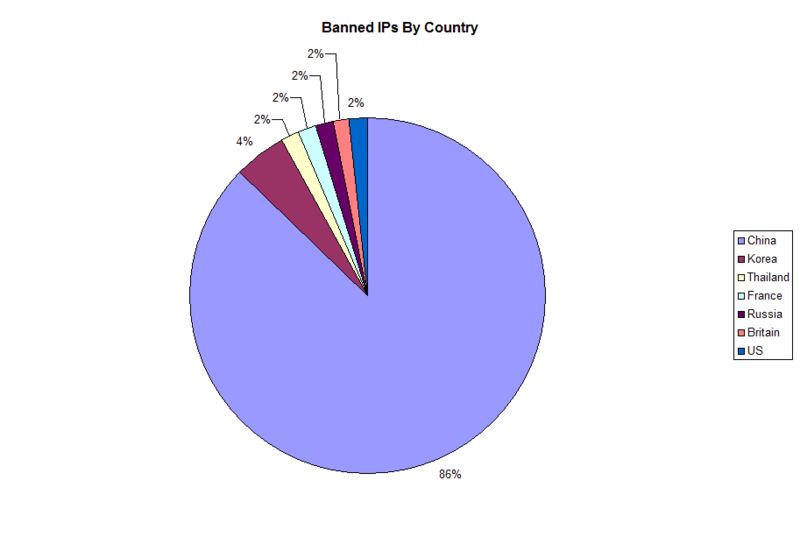 For fun I charted the IPs I had already banned by country. R Portable Version 3.1.0 Is Released! R Portable Version 3.1.0 has been released and is available at the R Portable project page, http://sf.net/projects/rportable/. R Portable Version 3.1.0 incorporates the 3.1.0 version of R in a portableapps format. Author BillPosted on Saturday, 12 Apr 2014 Friday, 18 Jul 2014 Categories RTags RLeave a comment on R Portable Version 3.1.0 Is Released! R Portable Version 3.0.3 and RStudioPortable Version 0.98.501 Are Released! R Portable Version 3.0.3 and RStudioPortable Version 0.98.501 have been released and are available at the R Portable project page, http://sf.net/projects/rportable/. R Portable Version 3.0.3 incorporates the 3.0.3 version of R in a portableapps format. RStudioPortable Version 0.98.501 incorporates the 0.98.501 version of R Studio in a portableapps format. Author BillPosted on Wednesday, 19 Mar 2014 Friday, 18 Jul 2014 Categories RTags RLeave a comment on R Portable Version 3.0.3 and RStudioPortable Version 0.98.501 Are Released! I think I found a bug in the Jetpack plugin for WordPress that is stopping me from publicizing my posts to social media sites. It worked under version 2.8 but was broken in 2.9. When I go back to the 2.8 version of publicize it works so why did they change the code? I am guessing but it looks like they fixed the problem with "Publicize for Admin and Editor only" they created a new problem with publicizing posts created using Live Writer and maybe other methods. Here is the code I am talking about.